That's the lie Kelley Winslow told to protect the boy she loves from a power he doesn't know he possesses. Devastated, Sonny retreats—to a haven for Lost Fae that's hidden deep underneath New York City. But Kelley's not about to let things end in heartbreak. To get Sonny back, she's got to find out who's after his magick—and how to use her own. She's got to uncover who's recruiting Janus Guards to murderously hunt innocent Faerie. She's got to help rebuild the shattered theater company she called family. And she's got to do it all without getting dangerously distracted by the Fennrys Wolf, whose legendary heart of stone seems to melt whenever he's around Kelley. Wow… where do I even begin? The Wondrous Strange series is amazing, definitely one of my favorite. The first novel hooked me in. I fell instantly in love with the whole world that Lesley created, as well as the characters. Then Darklight… wow, Darklight was an even more intense ride, and the ending nearly killed me. The writing was, like always, wonderfully descriptive and vivid. I also loved how we got to see completely different sides to several characters, such as Mabh. We saw an almost… kind side to her. Almost. And Sonny! My heart broke for him. He is just too sweet to be hurt like that. And then there is Fenn!!!!!!! AHHHHHHHH!!! I must honestly say that I am totally in love with Fenn. Under any other circumstances, I would be rooting for him, but of course, I’m Team Sonny. But Fenn really did win my heart. There was never a dull moment, or a page where something wasn’t happening. I was gasping dramatically *LE GASP! * or grinning like an idiot the entire time. If you haven’t picked up Tempestuous, go! Read it! Wow, thank you so much for this awesome review! 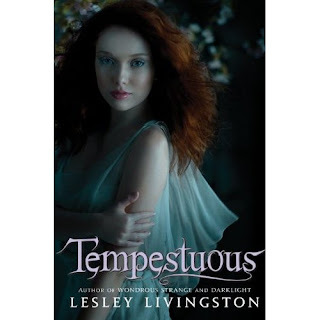 I read the first two books in this series, and I wasn't sure I wanted to pick up Tempestuous before, but now, I WILL! Aw, I'm totally team Fenn too! Glad to have someone on my side. Again, thanks for helping me decide. HOANG QUAN Transport brings the best service today http://thuexe16chorenhat.com, http://thuexedulich45cho.com/.